This volume is devoted to the syntax and semantics of various languages, studied with models based on constraints. 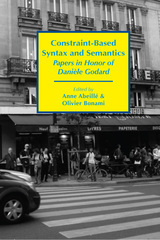 Both French and international linguists present their work in tribute to Danièle Godard, emeritus research director at the Centre national de la recherche scientifique in France, a member of the Laboratoire de Linguistique Formelle at Université Paris Diderot, and a specialist in the syntax and semantics of French and Romance languages. Past research conducted on natural language syntax has occasionally employed the well-known mathematical formalism Context-Free Grammar, defined by Noam Chomsky in 1957. But recent studies have indicated that this approach may not always be ideal in analyzing all types of natural languages. Researchers in theoretical linguistics, psycholinguistics, cognitive science, and in natural language processing have recently converged on a collective insight: formalizing the syntax of words is central to describing, understanding, and analyzing language. This insight has sparked considerable interest in Tree Adjoining Grammar (TAG). 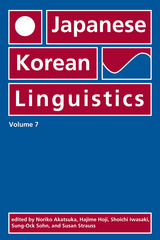 Unlike traditional approaches for analyzing natural language syntax, TAG is a lexically-oriented mathematical formalism that can precisely capture the syntactic properties of natural languages such as English, French, and Korean. 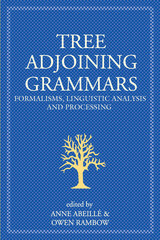 Tree Adjoining Grammars is the first ever collection of works that discusses the use of the TAG framework in natural language research. 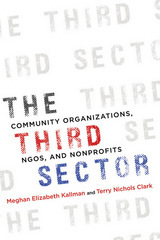 The volume begins with an introductory chapter that provides an overview of TAG and key research projects that have utilized the TAG framework in the past. Contributors discuss the formalism itself, its use in analyzing linguistic phenomena, and its use in building natural language processing systems. A glossary and extensive bibliography is included, allowing the volume to be accessible to a broad audience. The selection of works in this volume were presented at the Third International Workshop in Tree Adjoining Grammars and Related Formalisms held in Paris in 1994. 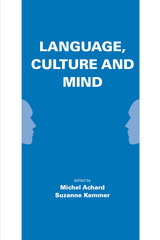 Language, Culture, and Mind is a stimulating collection exploring the ways that cognitive, social, and cultural categories are revealed through language. Contributors use methods such as psycholinguistic experiments and observations of natural discourse to probe how such categories are organized, with grammatical and semantic analyses—in modern cognitive frameworks—augmenting these approaches. Some of the phenomena studied include the linguistic expression of space and causality; aspect, classifiers, negation, and complement constructions; and metaphor, metonymy, and conceptual blending across different domains of human experience. 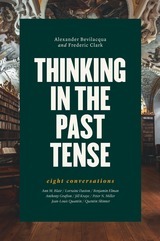 The result is a fresh perspective on the way language relates to thought and culture. Descriptive grammarians and typologists often encounter unusual constructions or unfamiliar variants of otherwise familiar construction types. Many of these phenomena are puzzling from the perspective of linguistic theories: they neither predict these “anomalies” nor, arguably, provide the tools to describe them insightfully. This book analyzes an unusual type of relative clause found in many related and unrelated languages of Eurasia. While providing a detailed case study of Tundra Nenets, it broadens this inquiry into a detailed typological exploration of this relative clause type. The authors argue that an understanding of this construction requires exploring the (type of) grammar system in which it occurs in order to identify the (set of) independent constructions that motivate its existence. The resulting insights into grammar organization illustrate the usefulness of a construction-theoretic syntax and morphology informed by a developmental systems perspective for the understanding of complex grammatical phenomena. Non-well-founded structures arise in a variety of ways in the semantics of both natural and formal languages. Two examples are non-well-founded situations and non-terminating computational processes. A natural modelling of such structures in set theory requires the use of non-well-founded sets. 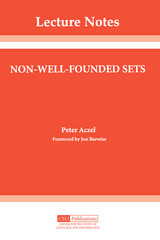 This text presents the mathematical background to the anti-foundation axiom and related axioms that imply the existence of non-well-founded sets when used in place of the axiom of foundation in axiomatic set theory. 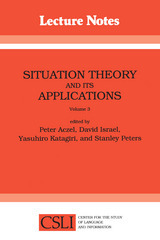 These essays evolved from research presented at the Third International Conference on situation theory and its applications. Situation Theory is the result of an interdisciplinary effort to create a full-fledged theory of information. Created by scholars and scientists from cognitive science, computer science and AI, linguistics, logic, philosophy, and mathematics, it aims to provide a common set of tools for the analysis of phenomena from all of these fields. The research presented in this volume reflects a growing international and interdisciplinary activity of importance to many fields concerned with the information. Peter Aczel is professor of mathematical logic and computer logic at Manchester University. David Israel is a senoir computer scientist in the Artificial Intelligence Center at SRI International abd a consulting professor in the Philosophy Department at Stanford University. Yasuhiro Katagiri is a research scientist in the Information Science Research Laboratory of NTT Basic Research Laboratories. Stanley Peters is professor of linguistics and symbolic systems at Stanford University. This book is meant to be a primer, that is, an introduction, to probability logic, a subject that appears to be in its infancy. Probability logic is a subject envisioned by Hans Reichenbach and largely created by Adams. 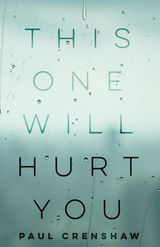 It treats conditionals as bearers of conditional probabilities and discusses an appropriate sense of validity for arguments such conditionals, as well as ordinary statements as premisses. 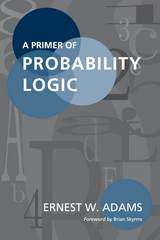 This is a clear well-written text on the subject of probability logic, suitable for advanced undergraduates or graduates, but also of interest to professional philosophers. 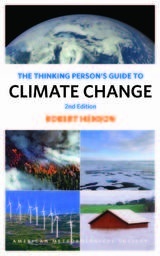 There are well-thought-out exercises, and a number of advanced topics treated in appendices, while some are brought up in exercises and some are alluded to only in footnotes. 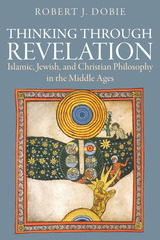 By this means, it is hoped that the reader will at least be made aware of most of the important ramifications of the subject and its tie-ins with current research, and will have some indications concerning recent and relevant literature. Buildings appear to rest on top of the earth's surface, yet the surface is actually permeated by the buildings' foundations-out of view. If a foundation's blueprints are unavailable, as in archaeology, excavation would be needed to discover what actually supports a specific building. Analogously, the fields of geometry and topology have easily observable concepts resting on the surface of theoretical underpinnings that have not been completely discovered, unearthed or understood. Moreover, geometrical and topological principles of superposition provide insight into probing the connections between accessible superstructures and their hidden underpinnings. This book develops and applies these insights broadly, from physics to mathematics to philosophy. Even analogies and abstractions can now be seen as foundational superpositions. 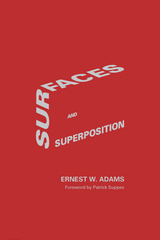 This book examines the dimensionality of surfaces, how superpositions can make stable frameworks, and gives a quasi-Leibnizian account of the relative `spaces' that are defined by these frameworks. Concluding chapters deal with problems concerning the spatio-temporal frameworks of physical theories and implications for theories of visual geometry. The numerous illustrations, while surprisingly simple, are satisfyingly clear. Anthropologists claim to have made mankind aware of its own prehistory and its importance to human self-understanding. Yet, anthropologists seem hardly to have discovered their own discipline's prehistory or to have realized its importance. William Y. Adams attempts to rectify this myopic self-awareness by applying anthropology's own tools on itself and uncovering the discipline's debt to earlier thinkers. Like most anthropologists, Adams had previously accepted the premise that anthropology's intellectual roots go back no further than the moral philosophy of the Enlightenment, or perhaps at the earliest to the humanism of the Renaissance. In this volume, Adams recognizes that many good ideas were anticipated in antiquity and that these ideas have had a lasting influence on anthropological models in particular. He has chosen five philosophical currents whose influence has been, and is, very widespread, particularly in North American anthropology: progressivism, primitivism, natural law, German idealism, and "Indianology". 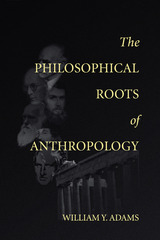 He argues that the influences of these currents in North American anthropology occur in a unique combination that is not found in the anthropologies of other countries. Without neglecting the anthropologies of other countries, this work serves as the basis for the explanation of the true historical and philosophical underpinnings of anthropology and its goals. Throughout history, religion has been the primary tool used by human societies to understand the inexplicable and the powerful. 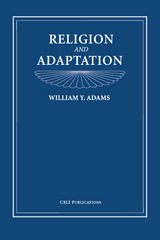 Religion and Adaptation examines how this role of religion affects the development of human society and individual identity. This volume presents the proceedings of the fifteenth West Coast Conference on Formal Linguistics held at the University of California, Irvine. This volume is a comprehensive representation of the papers presented at the conference in the areas of syntax, semantics and phonology, including a special focus on Native American phonology and syntax. Topics range from underspecification and natural classes to child language, with languages covered ranging from Basque to Navajo. This volume will be of interest to a wide range of linguists covering numerous special interests and fields. 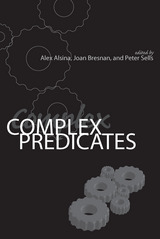 Complex predicates can be defined as predicates which are composed of more than one grammatical element (either morphemes or words), each of which contributes a non-trivial part of the information of the complex predicate. 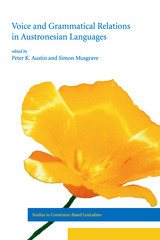 The papers collected in this volume, which were presented at a workshop at Stanford in 1993, represent a variety of approaches to the question of the range and nature of complex predicates, and draw on data from a wide spectrum of languages. 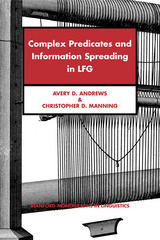 This collection develops a better understanding of the range of phenomena that a general theory of complex predicates would have to account for, and to see what kinds of linguistic ideas and methodologies would be necessary for such a task. These papers treat those issues involved in formulating a logic of propositional attitudes and consider the relevance of the attitudes to the continuing study of both the philosophy of language and the philosophy of mind. C. Anthony Anderson is professor of philosophy and Joseph Owens is assistant professor of philosophy, both at the University of Minnesota. 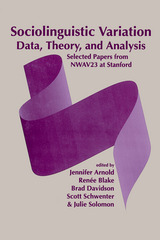 This volume collects selected papers from the twenty-third New Ways of Analyzing Variation (NWAV23) conference held at Stanford University. It is a collection of innovative papers on the newest developments in research on variation. 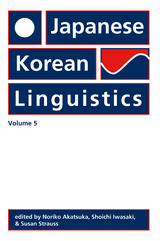 The range of topics covered in this collection include: phonological variation, morphosyntactic variation, register and style, discourse, codeswitching, and language change. A foreword by John Rickford ties the collection together. 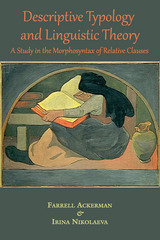 This volume will be of interest to sociolinguists, sociologists, and any scholar interested in comparative linguistics. Logic and Pragmatism features a number of the key writings of Giovanni Vailati (1863–1909), the Italian mathematician and philosopher renowned for his work in mechanics, geometry, logic, and epistemology. The selections in this book—many of which are available here for the first time in English—focus on Vailati’s significant contributions to the field of pragmatism. 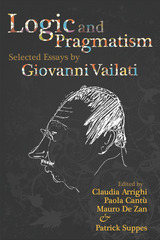 Accompanying these pieces are introductory essays by the volume’s editors that outline the traits of Vailati’s pragmatism and provide insights into the scholar’s life. This volume explores various problems in the syntax of Austronesian languages, which are found primarily in Malaysia and the Polynesian islands. 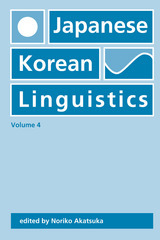 Using the framework of constraint-based theories of syntax, contributors discuss the nature of these voice systems, the function of their verbal morphology, valence, verbal diathesis and transitivity in such languages, and the nature of their lexical categories. Each analysis is presented within the frameworks of lexical-functional grammar and head-driven phrase structure grammar.